Tyneside Community Action Against Racism (TCAR): Barnardo’s ‘Believe in children’ – what about the children of asylum seekers? Stop detaining children – pull out of Cedars now! Barnardo’s ‘Believe in children’ – what about the children of asylum seekers? Stop detaining children – pull out of Cedars now! 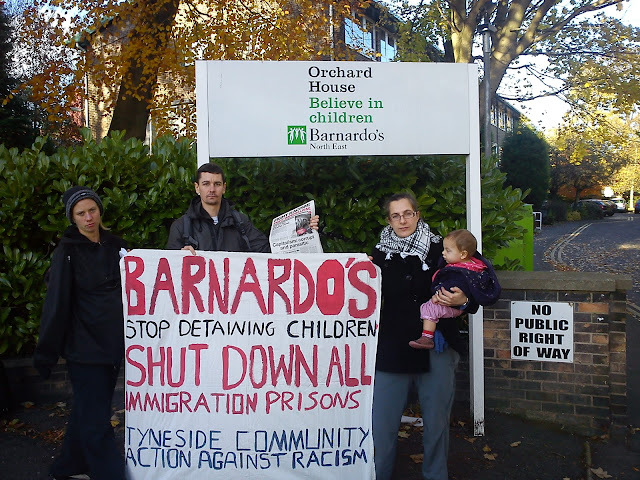 We demand Barnardo’s ceases its involvement in child detention. We demand Newcastle City Council put pressure on Barnardo’s to pull out of their Cedars child imprisonment contract or risk losing its £600,000 contract with the council to provide youth services. As part of a national day of action called by Barnardo’s Out on 8th November 2012 Tyneside Community Action against Racism (TCAR) went to Barnardo’s regional head offices in Jesmond to hand in a letter demanding their immediate withdrawal from the contract with UK Border Agency to run Cedars ‘pre-departure accommodation’ for families awaiting deportation and an end to their involvement in child detention. And on Saturday 10th December, TCAR held a demonstration outside a Barnardo’s charity shop on Adelaide Terrace, Benwell. Both actions were met with support from Barnardo’s workers who do not agree with the contract and from a lot of local people passing by. Barnardo’s said that it took the contract at Cedars to help ensure children’s welfare yet this ‘pre-departure accommodation’ in Sussex is nothing more than a prison for families seeking asylum and Barnardo’s run it with notorious security thugs G4S – the very same firm who murdered Jimmy Mubenga during a forced deportation on 12 October 2010. As well as its contract with UKBA, Barnardo’s has a yearly contract worth £600,000 with Newcastle City Council to provide youth services. The tender Barnardo’s applied for was for four different parts of the city and organisations had to submit separate tenders for each area but Barnardo’s won the contract for all of them. Labour-run Newcastle Council is pushing through £90m worth of cuts to local funding, with the 2013-2016 budget due to be finalised on 6th March 2013. These cuts include the complete scrapping of the Place Service and all but two workers in the Youth Service. In order to create new sources of profit for British imperialism the government and local councils increasingly outsource public services to private multinationals like G4S and other unethical providers like Barnardo’s. Please put pressure on your councillors to demand Barnardo’s pulls out of the Cedars contract or risk losing its contract with the council. Write letters to your councillors, go to their surgeries, stage protests – contact TCAR for more information and support with this. Despite the government claiming it has ended the detention of migrant children, a total of 47 children were detained in quarter 3 of 2012 (this does not include children whose age is disputed). Of these, 20 children entered Cedars ready to be deported and since it was opened in August 2011 more than 39 families with 84 children have been locked up there. Cedars staff have used “unacceptable force” with at least six families during the period of inspection, including using violence against children. In one case, staff assaulted a pregnant woman in a wheelchair and dragged another woman by her hair. Family members held in Cedars have self-harmed. The same families have been detained at Cedars repeatedly – longer than the 7 day limit. Half (49%) of the families had no legal representation. Two members of staff have already been suspended for inappropriate behaviour. Unlike other prisons and detention centres, there are no clear rules about the use of force at Cedars. Stop locking up children! Shut down all immigration prisons! Stop deportations!